The 2018 Best Of TV Awards winner in the category of Best Action or Drama Program is - Scorpion (CBS). This years winner for Best Action or Drama Program is Scorpion (CBS), with 134 votes. This was his 2nd consecutive Win in this category. This was his 2nd consecutive finals appearance. Runner up is 2013 & 2014 Winner in this category & 2012 Best New Program Winner, Arrow (CW) with 95 votes in their 6th consecutive finals appearance (3rd, 2nd, 3rd, 1st, 1st). Third, MacGyver (CBS) with 75 votes in their 1st finals appearance. Fourth was This Is Us (NBC) with 49 votes in their 2nd consecutive finals appearance (6th). Fifth, The Blacklist (NBC) with 46 votes, in their 2nd consecutive finals, 4th total appearance (4th, 5th, 8th). Sixth, is Hawaii Five-0 (CBS) with 42 votes in their 8th consecutive finals (4th, 4th, 9th, 10th, 7th, 6th, 8th). Seventh was the 2017 Best New Program Winner, The Good Doctor (ABC) with 35 votes in their 1st finals in this category. Eight, NCIS (CBS) in their 1st finals appearance. Ninth, is Criminal Minds (CBS) with 23 votes in their 9th consecutive finals appearance (7th, 3rd, 8th, 6th, 3rd, 5th, 2nd, 3rd). 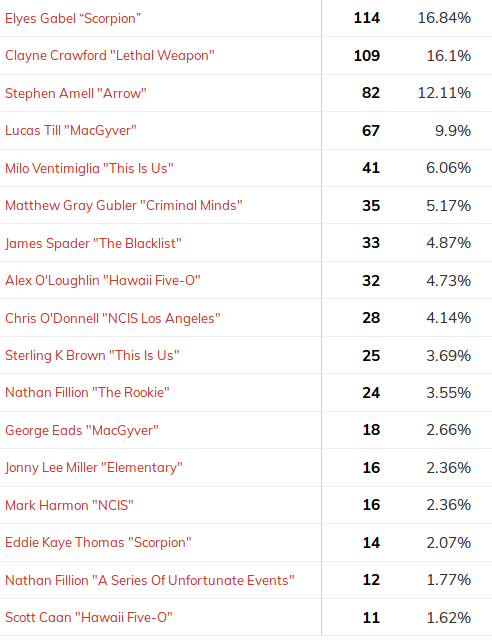 Tenth, NCIS Los Angeles with 14 votes in their first finals appearance. Scorpion Winning total of 106 votes breaks the record for lowest winning total in this category, previous held by 2017 winner Sherlock. Their margin of victory of 11 also breaks the previous record for lowest margin of victory from 2016 Person Of Interest over Arrow by 15 votes. 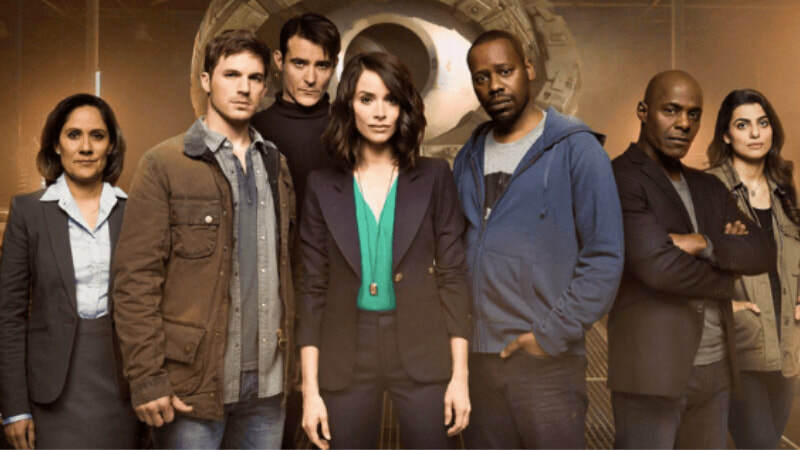 The 2018 Best Of TV Awards winner in the category of Best Sci-Fi or Fantasy Program is - Timeless (NBC). This years winner for Best Sci-Fi or Fantasy Program is Timeless (NBC), with 202 votes. This was his 2nd consecutive Win in this category. This was his 2nd consecutive finals appearance (4th). Runner up is the 5 time Winner of this award (2010, 11, 13, 14, 16) Supernatural (CW) with 120 votes in 9th consecutive finals appearance (2nd, 1st, 3rd, 1st, 1st, 2nd, 1st, 1st). Third, is the 2017 Winner in this category, Lucifer (FOX) with 55 votes. This was their 2nd consecutive finals appearance (1st). Fourth was Gotham (FOX) with 38 votes in their 2nd finals appearance (9th) and first since 2016. Fifth, the 2014 Best New Program Winner, The Flash (CW) with 33 votes, in their 4th consecutive finals appearance (7th, 5th, 2nd). Sixth, is Doctor Who (BBC ONE) with 30 votes in their 4th finals, (6th, 2nd, 3rd), and first since 2015. Seventh was Daredevil (NETFLIX) with 27 votes in their first finals. 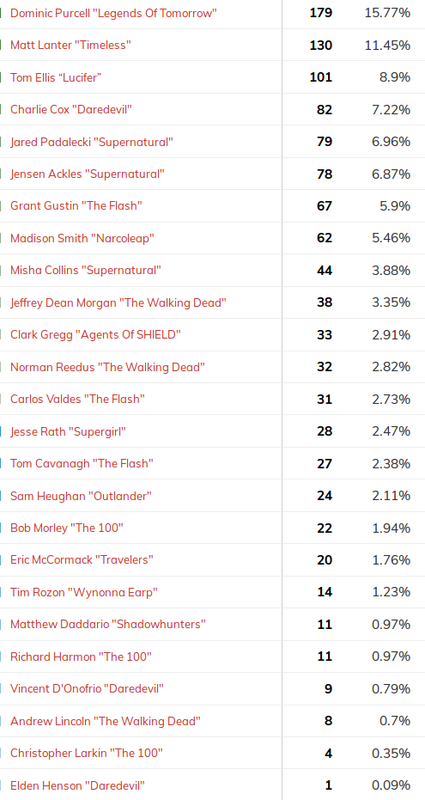 Eight, Legends Of Tomorrow (CW) with 25 votes in his their finals appearance. Ninth, 2012 Winner in this category, and the 2010 New Program Winner, The Walking Dead (AMC) with 22 votes in their 7th consecutive finals appearance (6th, 5th, 6th, 9th, 1st, 6th) in a tie with Wynonna Earp (SYFY) in their 2nd consecutive finals appearance (9th). Agents Of SHIELD was in their 5th consecutive finals appearance (8th, 8th, 8th, 4th). 2011 Best New Program Winner Once Upon A Time was in their 6th finals appearance (3rd, 7th, 3rd, 6th, 3rd), and first since 2016. Supergirl was in their 3rd consecutive finals appearance (10th, 2nd). In their first finals appearance were, Travelers, Shadowhunters. Timeless wins their second Program award (2016 Best New Program), and becomes the first NBC program to win multiple Program awards. The 2018 Best Of TV Awards winner in the category of Best Comedy Program is - The Big Bang Theory (CBS)". This years winner for Best Comedy Program is The Big Bang Theory (CBS), with 134 votes. This was their 3rd consecutive Win in this category, and 8th total in their 9th consecutive finals (1st, 1st, 2nd, 1st, 1st, 1st, 1st, 1st). Runner up is Brooklyn Nine Nine (FOX) with 106 votes in their 4th finals appearance, and 2nd consecutive (2nd, 5th, 7th). Third, The Good Place (NBC) with 88 votes. This was their 2nd consecutive finals appearance (4th). Sixth, is Shameless (SHOWTIME) with 35 votes in their 3rd finals (6th, 8th) and first since 2016. Seventh was Will & Grace (NBC) with 34 votes in their 2nd consecutive finals (3rd). 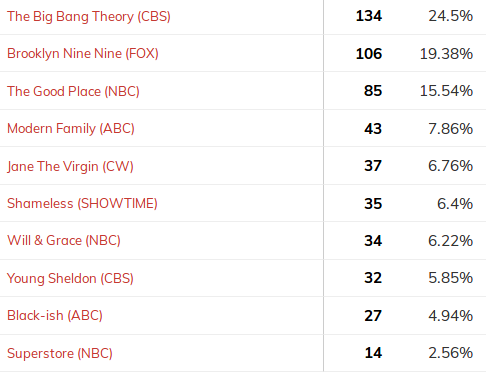 Eight, Young Sheldon (CBS) with 32 votes in their 1st finals appearance. Ninth, is Black-ish (ABC) with 27 votes in their first finals appearance. Tenth, Superstore (NBC) with 14 votes in their 2nd consecutive finals appearance (5th). The Big Bang Theory with wins in this category, as the most wins by a Program in any specific category. Their 8 wins in this category is also the most by ANY nominee in any category. Best Of TV Awards 2018 - WINNER - Best Action or Drama Actor - ELYES GABEL "SCORPION"
The 2018 Best Of TV Awards winner in the category of Best Action or Drama Actor is - Elyes Gabel "Scorpion". This years winner for Best Action or Drama Actor is Elyes Gabel "Scorpion", with 114 votes. This was his 2nd consecutive Win in this category. This was his 2nd consecutive finals appearance. Runner up is Clayne Crawford "Lethal Weapon" with 109 votes in his first finals appearance. Third, the 2016 Winner in this category, Stephen Amell "Arrow" with 82 votes. This was his 6th consecutive finals appearance (2nd, 1st, 6th, 2nd, 3rd). Fourth was Lucas Till "MacGyver" with 67 votes in his first finals appearance. Fifth, Milo Ventimiglia "This Is Us" with 41 votes, in his 2nd consecutive finals appearance (5th). Sixth, is Matthew Gray Gubler "Criminal Minds" with 35 votes in hs 3rd consecutive finals, and 5th total (9th, 8th, 8th, 5th). 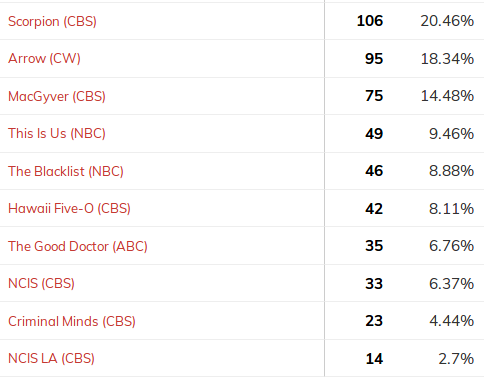 Seventh was James Spader "The Blacklist" with 33 votes in his 6th consecutive finals (3rd, 7th, 9th, 5th, 7th). Eight, Alex O'Loughlin "Hawaii Five-0" with 32 votes in his 7th consecutive finals appearance (7th, 4th, 7th, 8th, 4th, 2nd). Ninth, is Chris O'Donnell "NCIS Los Angeles" with 28 votes in his first finals appearance. Tenth, Sterling K. Brown "This Is Us" with 25 votes in his 2nd consecutive finals appearance (8th). 2011, 2012, 2015 Winner Nathan Fillion was in his 7th finals (4th, 1st, 4th, 2nd, 1st, 1st), his first for this program. Jonny Lee Miller was in his 2nd finals (6th) and first since 2013. In their first finals appearance were, George Eads, Mark Harmon, Eddie Kaye Thomas, Scott Caan. Elyes becomes the first repeat winner since 2011-12 by Nathan Fillion. Elyes winning margin of 5 votes over Clayne Crawford is the smallest margin of victory in this category. Breaking the prior record of 7 votes that Nathan Fillion beat Michael Emerson in 2015. Best Of TV Awards 2018 - WINNER - Best Action or Drama Actress - MANDY MOORE "THIS IS US"
The 2018 Best Of TV Awards winner in the category of Best Action or Drama Actress is - ". This years winner for Best Action or Drama Actor is Mandy Moore "This Is Us", with 76 votes. This Was her 2nd consecutive finals appearance (3rd). Runner up is Emily Bett Rickards "Arrow" with 67 votes in her 6th consecutive finals appearance (2nd, 3rd, 5th, 1st, 2nd). Third, the 2017 Winner in this category, Jadyn Wong "Scorpion" with 59 votes. This was her 2nd consecutive finals appearance (1st). Fourth was Katherine McPhee "Scorpion" with 56 votes in her first finals appearance. Fifth, Daniela Ruah "NCIS Los Angeles" with 49 votes, in her first finals appearance. Sixth, is Meredith Eaton "MacGyver" with 46 votes in her first finals appearance. Seventh was Tristin Mays "MacGyver" with 44 votes in her first finals. Eight, Katie Cassidy "Arrow" with 39 votes in her 3rd finals appearance (7th, 10th, 8th tied with Jodie Comer "Killing Eve" in her first finals appearance. 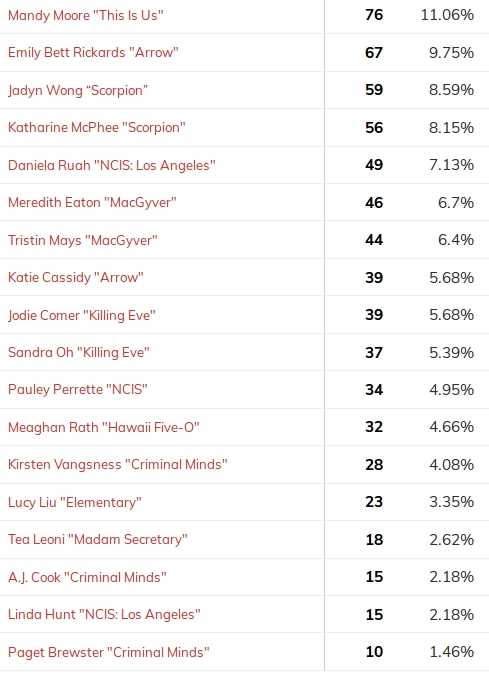 Tenth, Sandra Oh "Killing Eve" with 37 votes in her first finals appearance. Pauley Perrette was in her 2nd finals (5th) in 2015. Lucy Liu was in her 4th finals, 2nd consecutive (8th, 11th, 6th). A.J. Cook was in her 2nd finals (4th) in 2011. Paget Brewster was in her 2nd finals (5th) in 2011. In their first finals appearance were, Meaghan Rath, Kirsten Vangsness, Tea Leoni, Linda Hunt. Mandys win is the first for the show in the BOTVAs. Mandys 76 votes is the lowest winning vote total. 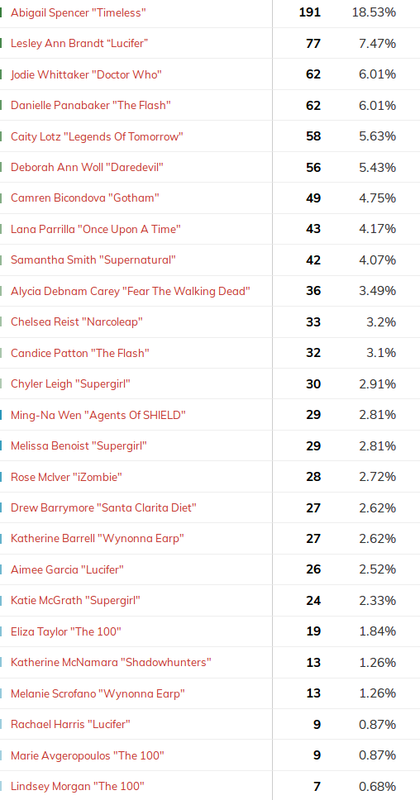 Breaking last years total of 149 votes by Jadyn Wong. 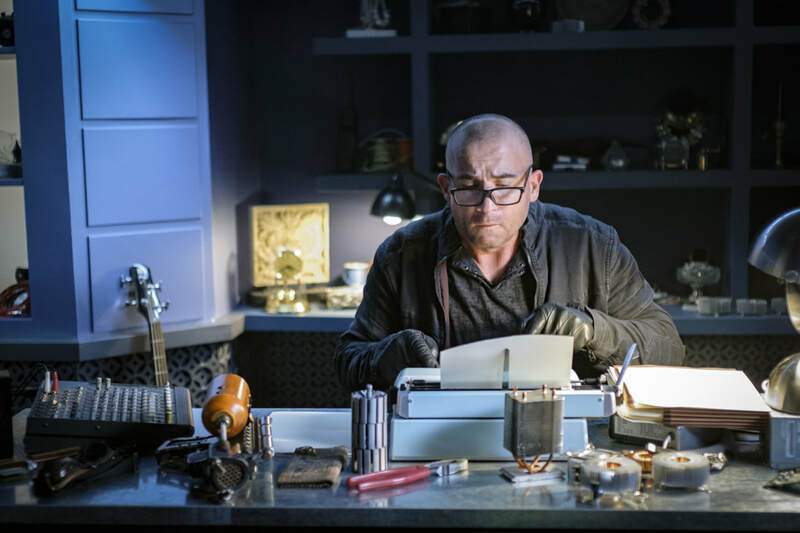 Best Of TV Awards 2018 - WINNER - Best Sci-Fi or Fantasy Actor - DOMINIC PURCELL "LEGENDS OF TOMORROW"
The 2018 Best Of TV Awards winner in the category of Best Sci-Fi or Fantasy Actor is - Dominic Purcell "Legends Of Tomorrow". This years winner for Best Sci-Fi or Fantasy Actor is Dominic Purcell "Legends Of Tomorrow", with 179 votes. This Was his first finals appearance. Runner up is Matt Lanter "Timeless" with 130 votes in his first finals appearance. Third, the 2017 Winner in this category, Tom Ellis "Lucifer" with 101 votes. This was his 3rd consecutive finals appearance (1st, 6th). Fourth was Charlie Cox "Daredevil" with 82 votes in his first finals appearance. Fifth, Jared Padalecki "Supernatural" with 79 votes, in his 8th consecutive finals appearance (6th, 3rd, 3rd, 10th, 6th, 5th, 3rd). Sixth, is the 5 time Winner (2011, 2013, 2014, 2016 this category) Best Actor Categrory Winner (*2010 Best Actor) Jensen Ackles "Supernatural" with 78 votes in hs 9th consecutive finals (1st, 1st, 2nd, 1st, 1st, 2nd, 1st, 2nd). Seventh was Grant Gustin "The Flash" with 67 votes in his 5th consecutive finals (3rd, 4th, 4th, 2nd). Eight, Madison Smith "Narcoleap" with 62 votes in his first finals appearance. Ninth, is Misha Collins "Supernatural" with 44 votes in his 8th consecutive finals appearance (7th, 5th, 10th, 11th, 5th, 4th, 4th). Tenth, Jeffrey Dean Morgan "The Walking Dead" with 38 votes in his 2nd consecutive finals appearance (8th). Clark Gregg was in his 4th finals (13th, 13th, 4th), first since 2016. Norman Reedus, the 2012 Winner, was in his 5th finals appearance (7th, 6th, 9th, 1st) and 1st since 2015. Carlos Valdes was in his 2nd finals (20th)and first since 2015. Tom Cavanagh was in his 3rd finals (9th, 20th), and first since 2016. Bob Morley was in his 2nd finals (8th) and first since 2015. Andrew Lincoln was in his 2nd finals (9TH) and first since 2015. In their first finals appearance were, Jesse Rath, Sam Heughan, Matthew Daddario, Richard Harmon, Vincent D'Onofrio, Christopher Larkin, Elden Henson. 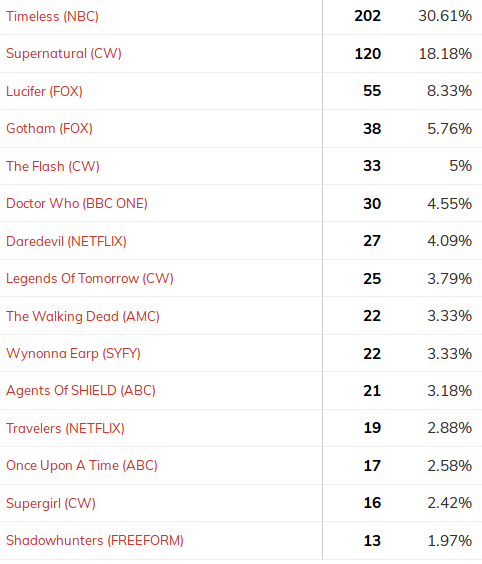 Dominics win is the first for a CW show in this category outside of Supernatural. Eldon Henson with 1 vote, breaks the previous record for least votes in the category of 10 in 2016 by Cory Michael Smith. This was the first time Jensen Ackles did not finish 1st or 2nd, it was also the first time his cast mate Jared Padalecki beat him. Best Of TV Awards 2018 - WINNER - Best Sci-Fi or Fantasy Actress - ABIGAIL SPENCER "TIMELESS"
The 2018 Best Of TV Awards winner in the category of Best Sci-Fi or Fantasy Actress is - Abigail Spencer "Timeless". This years winner for Best Sci-Fi or Fantasy Actress is Abigail Spencer "Timeless", with 191 votes. This is Abigails second Win in this category in her 2nd finals. Runner up is 2017 Winner, Lesley Ann Brandt "Lucifer" with 77 votes. This is her 3rd consecutive finals appearance (1st, 8th). Third is a tie., Jodie Whittaker "Doctor Who" with 62 votes in her first finals appearance. Danielle Panabaker "The Flash" in her 2nd finals appearance (6th in 2016). Fifth was Caity Lotz "Legends Of Tomorrow" with 58 votes in her 2nd consecutive finals appearance. (7th). Sixth, Deborah Ann Woll "Daredevil" with 56 votes in her first finals appearance. Seventh, Camren Bicondova "Gotham" with 49 votes in her 2nd finals (11th in 2016). Eight, is Lana Parrilla "Once Upon A Time" with 43 votes in her 7th consecutive finals (6th, 5th, 5th, 2nd, 4th, 3rd). Ninth, is Samantha Smith "Supernatural" with 42 votes in her 1st finals appearance. Tenth, is 2015 Best Recurring Actress Winner, Alycia Debnam Carey "Fear The Walking Dead" with 36 votes in her 2nd consecutive finals appearance (11th). Candice Patton was in her 2nd finals appearance (8th) and first since 2015. Katherine Barrell was in her 2nd finals (15th) and first since 2016. Lindsey Morgan was in her 2nd finals (21st) and first since 2015. Abigail becomes the first 2 time winner in this category, after 8 consecituve first time winners from 8 different shows.